The rotator cuff belongs to the shoulder muscles and is part of the shoulder girdle. It is very important for the mobility and stabilization of the shoulder joint. the musculus subscapularis from the inside of the scapula. The infraspinatus, supraspinatus, and teres minor insert into the tuberculum majus at the upper exterior part of the humerus. The subscapularis inserts into the tuberculum minus humeri at the upper interior part of the humerus. 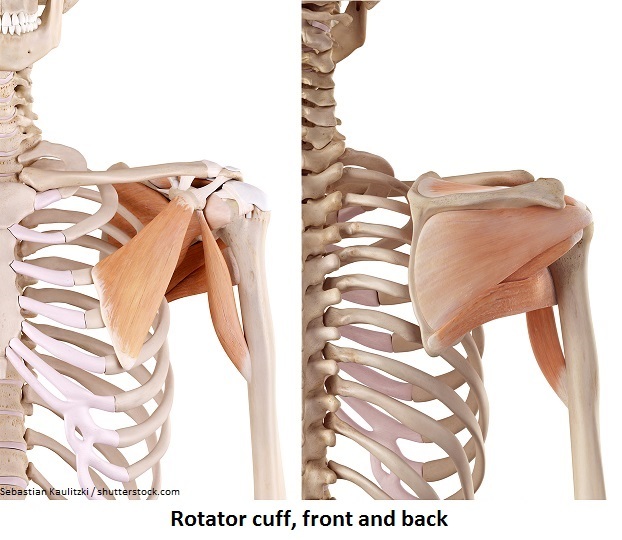 The muscles of the rotator cuff can be divided into inward and outward rotators, in accordance with their main functions. The musculus subscapularis is the inward rotator and also involved in the adduction and abduction of the arm depending on the respective fibre content. The infraspinatus, supraspinatus, and teres minor represent the outward rotators. The musculus teres minor also moves the arm toward the body laterally (adduction). The musculus supraspinatus also moves the arm away from the body laterally (abduction). Besides its diverse motion functions the rotator cuff stabilizes the upper arm in the shoulder joint. This is very important since the shoulder joint lacks a bony stabilization and just has a thin capsule with low ligament support. Especially for gymnastics, swimming, throwing, and batting disciplines the rotator cuff fulfills essential functions. The four muscles of the rotator cuff are quite vulnerable for wear and injuries. The structure and alignment of all parts within the shoulder is very narrow and doesn’t leave much space for alteration. Complaints, like the painful arc can be tedious. A regular training of these muscles can prevent such problems.